BBC NEWS | Have Your Say | Who should be the next Doctor Who? Popular cult TV series Doctor Who is returning to UK screens after a 14 year absence. Although casting and transmission details haven't been released the new series will be written by acclaimed TV dramatist Russell T Davies and made by BBC Wales. Is it a good idea to revive Doctor Who as a TV series? Who should take the title role? Are the any other cult series that you'd like to see return? Richard E Grant will be superb as the Doctor. There is nothing wrong with Paul McGann he is an excellent actor and could still do well. I think Stephen Fry would add the wit as well as the accent needed to be both respectful to the past and bring the show up to date. How about a semi-reprogrammed (i.e. 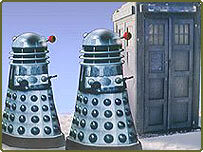 still potentially dangerous) Dalek as his assistant? That would be worth watching! Ardal O'Hanlan would make a great Dr, to be sure. Ok here's the deal let's get McGann and that horrible telefilm out of our misery and leave them firmly in the past. As for new Drs I suggest for a more serious doctor with hints of quirky, Anthony Stewart Head of Buffy fame or if there were to be a quirky doctor with hints of serious (ala Tom Baker) how about give the nod to Eddie Izzard! Great news! Tom Baker should be the doctor again, it was never the same without him. Otherwise Patrick Stewart. Eddie Izzard! What a fantastic idea! Funny, mysterious, unpredictable - in other words Tom Baker without the scarf! Otherwise, I'd be willing to have a crack at it (got to do something with my acting diploma and it was always a childhood dream of mine to be Dr Who. Keep the doctor, Tardis and Daleks - but throw the rest of it away - start afresh with an actor no one knows or use the three favourites for the next three regenerations, Richard E Grant, Eddie Izzard and Alan Davis (when he is a bit older.) Good luck, I look forward to what ever you do with it! Woo hoo. I've been hoping for Dr. Who to return since I saw the last few. It's long awaited. I just hope and pray they get it 'right'. PLEASE don't overdo the special effects budget at the cost of the cool storylines. There's certainly (IMHO) enough material for scripts in some of the books that have never been televised. Now all I have to do is figure out how to go about getting a minor role in the cast. Bring the series into the present and make the hero Jason Statham and his side kick Kelly Brook. Paul MaGann, naturally. He did a great job in the movie, has done a great job with the audio CDs, he should return. Then, if he only agrees to do one season, it should go to Mark Gatiss of League of Gentlemen fame. I saw a picture of him, as a doctor, putting his head out of the TARDIS. He looked like a cross between Magnus Pike and Patrick Moore, very eccentric. Good Luck with the project. I'm looking forward to Saturday nights once more. My Doctor was Patrick Troughton, I'm 43 years old! If they're opting for the 'cheesy' look, I think someone like Christopher Biggins would be ideal. I was impressed with Paul McGann in the telemovie, webcast Shada and audio adventures. I'd like to see him as The Doctor in a TV series role. I think the show needs to return to its roots (60s/70s), with a mix of good writing, scary monsters/mad scientists, some (not too much!) humour, and decent (not over the top!) acting. I wholeheartedly welcome the return of the doctor (a la Sherlock Holmes). It would definitely have to be a staunch Englishman playing the role. I agree with the other comments that Richard E. Grant would make a fine doctor...however...it would be a time-limiting commitment. Who would play the screaming girlie-assistant part? Yes, please bring Dr. Who back! As for who to play the Dr., every Dr. has been great. Just choose them like you always have. I definitely think Eddie Izzard was born for the job. I think the BBC would be unwise not to capitalise upon the success and popularity of Paul McGann in the role. However, I do think that Ian Richardson would be stupendous in the part, or perhaps someone like Hugh Laurie or Paul Rhys. Richard E Grant would make a great Dr but we would need new adversaries for the Doctor along the lines of the Borg. As although Daleks with their plungers were scary for me as a child they somehow don't quite do it for my 6 year old who finds it all very tame. David Blaine of course - he is used to being attacked by strange creatures. Bill Nighy seems to be a favourite among fans - and with Russell T. Davies. William Hartnell was the only real Dr Who. All the rest were just a way of stretching the programme out. I think Laurence Llewellyn-Bowen would be a good choice. He could really do something with the inside of the Tardis with MDF. Paul McGann should continue as the Doctor. He is successful at pleasing the fans, the critics and the public. Also - he is perfect for the role. Why bother scuppering the show with someone who isn't? As a lifelong American fan (complete with eight foot cardboard Tardis model in my basement) I would be the first to admit the telemovie was not up to par. For this series to work again it'll be like catching lightning in a bottle, twice. However, the Doctor has certainly been able to overcome long odds before. And I cannot express how immensely excited I am to see his return. The next Doctor Who should be John Major. The name alone is a perfect match for this ex-Prime Minister whom time forgot. If not Paul McGann, who was excellent in the 1996 TV movie, then the next doctor should definitely be Richard E Grant. He is a big name and is suitably quirky. I have also heard him say that when he plays the role for the BBCi webcast he will be 'Like Sherlock Holmes in space' which seems like a perfect template for me! Doctor Who was never just a "cult series"!! It was the most popular sci-fi series the BBC has ever made and had massive appeal to folk of all ages not just to a few "cultists". My fear is that it will now be "brought up to date" and ruined by a new production team. I just hope they can do it justice, but I worry that they can't. Well it's about time! Saturday tea time hasn't been the same for almost 15 years. I'll have to move the couch away from the wall so I can hide behind it again! The series failed (apart from fund starvation and no time) in the 80's because it 'fell in on itself'. The character became distant, remote and a general audience (who lets face it the show should be for) could no longer be bothered to relate to him. Make him the hero that the first four Dr's were. Ensure the audience are discovering horror, mysteries and wonder AT THE SAME TIME AS OUR HERO!! Bring it back By all means. I think it would have to be either very dark and gothic or similar to the first highlander though. It'd be great if BBC America carried this. That way those of us stateside could watch it. Any one know ? In my mind, there's no question about it. For the sake of pure continuity, Paul McGann should play the next Doctor. Also I would like to see inside of the Tardis resemble a modernised version of the old UK TV series instead of the one used in the US spin-off. Highly unlikely, but Ewan MacGregor has the personality to pull off a great Doctor Who. From the world of television, I would have to go with Rik Mayall. Who else has the credentials, and humour, to create a character to rival Tom Baker's incarnation of The Doctor? Alan Davies, Paul McGann, Richard E Grant, any of these could do a good job of playing the Doctor. But please, play it straight! Leave the legends Nicholas Parsons and Hale & Pace in the past! Paul McGann played the doctor brilliantly in the otherwise mediocre 1996 telefilm. He should be offered the chance (if he wants it) to develop his interpretation of the character. Get Anthea Turner into it somewhere - I always hide behind the sofa when she comes on! I'm just SO happy with this news! A life long fan (now 41) I never thought it would come back. I just hope it's re-born with a lot of the love, care and attention that it deserves. Samuel L. Jackson, he'd give the Daleks something to worry about! I'd love to see the Doctor make a comeback, and for my 2p worth, Richard E Grant is suitably quirky for the lead role. By the way, has anyone looked at resurrecting Blake's 7? Why flog a dead horse? - Dr who reached its zenith in the 70s. It used to be a programme that had the whole family covering their eyes at the sight of the Daleks, but British culture has changed so significantly since then that without a complete revamp (which would probably lose the essence of why it became cult watching), it will appear far too tame for our desensitised society. Fantastic - I can't wait to see the Daleks back in action. Paul McGann was a very convincing Doctor ... Richard E Grant (who I thought was tipped as the next one) would also be good. Ant and Dec - they seem to get every other gig at the minute! I think after all this time a female Doctor would be a welcome change - Joanna Lumley or Judie Dench would be ideal. I don't think anyone should play Dr Who. If they bring it back "they" will mess on with it adding loads of pointless special effects etc and turn it into a steaming pile. You just have to look at the spates of remakes/modern versions of old films to see what happens. Leave it alone, by all means reshow the old stuff, but leave us with our fond memories.